(Nanowerk Spotlight) The efficiency of catalyzing the oxygen reduction reaction (ORR) – the process that breaks the bonds of oxygen molecules – to a large degree determines the electrochemical performance of fuel cells. Platinum and platinum-based composites have long been considered as the most efficient ORR catalysts. Platinum's drawback, besides its high cost, has been its lack of stability once it is becomes active inside a fuel cell. In their search for practically viable non-precious metal ORR catalysts, researchers have also been investigating vertically-aligned nitrogen-containing carbon nanotubes (VA-NCNTs). We reported on this research back in 2009 ("Nitrogen-doped carbon nanotube catalyst systems for low-cost fuel cells"). In this earlier work, the research group of Liming Dai (at that time at the University of Dayton, now Kent Hale Smith Professor in the Department of Chemical Engineering at Case Western Reserve University), showed that these metal-free VA-NCNTs catalyze a four-electron ORR process with a much higher electrocatalytic activity, more resistant to CO-poisoning, and better long-term operation stability even than that of commercially available or similar platinum-based electrodes in alkaline electrolytes. "The substantially improved catalytic performance for the VA-NCNT catalyst was attributed to the electron-accepting ability of the chemically-bonded nitrogen atoms, which creates net positive charge on adjacent conjugated carbon atoms to facilitate the chemical adsorption of oxygen and to readily attract electrons from the anode for facilitating the ORR," Dai explains to Nanowerk. Follow-up research carried out by many groups worldwide in addition to Dai's, has confirmed the initial findings; see for instance "Nitrogen-Doped Graphene as Efficient Metal-Free Electrocatalyst for Oxygen Reduction in Fuel Cells" and "Metal-Free Carbon Nanomaterials Become More Active than Metal Catalysts and Last Longer". Dai points out that, in all of the previous work on the carbon-based metal-free ORR catalysts, it was essential to incorporate covalently-bonded nitrogen atoms into the carbon structure to generate intramolecular charge-transfer. "The tedious and costly chemical processes for the preparation of those carbon nanomaterials containing the covalently-bonded nitrogen atoms may preclude the possibility of their commercial applications," he says. In a new communication, published in the March 17, 2011 online issue of Journal of the American Chemical Society ("Polyelectrolyte Functionalized Carbon Nanotubes as Efficient Metal-free Electrocatalysts for Oxygen Reduction"), Dai's group reports their recent discovery that adsorption of positively-charged polyelectrolyte chains onto nitrogen-free carbon nanotubes (CNTs) could also create net positive charge on carbon atoms in the nanotube plane through the intermolecular charge-transfer. Having a strong electron-withdrawing ability, poly(diallyldimethylammonium chloride) (PDDA) was used to create net positive charge for carbon atoms in the nanotube carbon plane via intermolecular charge transfer. 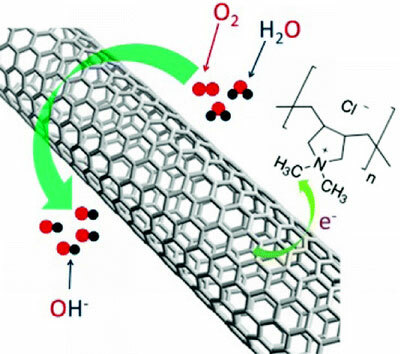 The resultant PDDA functionalized/adsorbed carbon nanotubes, either in an aligned or nonaligned form, were demonstrated to act as metal-free catalysts for oxygen reduction reaction (ORR) in fuel cells with similar performance as platinum catalysts. (Reprinted with permission from American Chemical Society). "Notably," says Dai "the adsorption of poly(diallyldimethylammonium chloride) (PDDA) onto all-carbon CNTs can show remarkable ORR electrocatalytic activities comparable to that of commercially available platinum/carbon electrodes – but with a better fuel selectivity and long-term durability." The ease with which efficient metal-free ORR electrocatalysts can be produced simply by adsorption-induced intermolecular charge-transfer suggests considerable room for cost-effective preparation of various metal-free catalysts for oxygen reduction, and even new catalytic materials for applications beyond fuel cells. "We believe that the methodology we developed in this study could serve as a general approach to the development of various metal-free catalysts" Dai concludes.